More than 400 buffaloes believed to have been chased by lions drowned in a river in northern Bostwana this week, the government said. The mass drowning occurred in Chobe River near the border with Namibia. 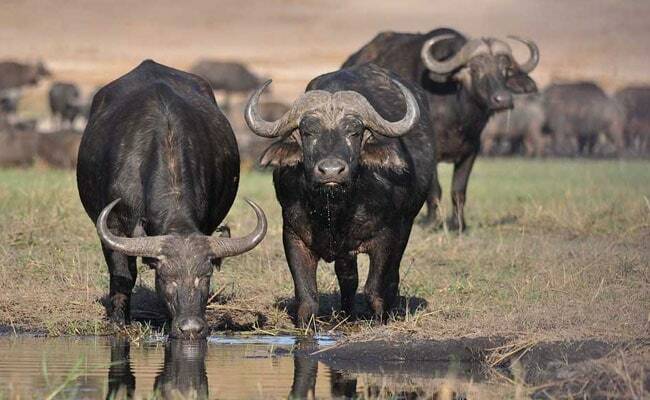 Early investigations by authorities in both countries "suggest that an exceptionally large buffalo herd was grazing in Namibia when they stampeded into the Chobe River," Botswana's Ministry of Environment, Natural Resources Conservation and Tourism said in a statement late Wednesday. "Initial indications are that they were being chased by a pride of lions," the ministry said. "It is estimated that more than 400 animals drowned due to the massive movement of buffalo trampling, and falling from steep river banks." Mass drownings are not uncommon, the ministry added. Namibian media reported that the incident occurred on Tuesday night.